Americans celebrated their nation’s 242nd anniversary of independence on Wednesday, with concerts, parades and a voracious display of hot dog-eating prowess in New York, as many cities and towns held fireworks displays after sundown. But the holiday was marked by a widely televised protest at the Statue of Liberty against ICE, or Immigration and Customs Enforcement. A woman scaled the statue’s pedestal, where she sat for four hours until police brought her down. Police said it was unclear if she was part of the protest against ICE and charges were pending. Also, two people died and several others were injured Tuesday evening in Rock Island Illinois after a large tree branch fell on them, police reported in local media. At the White House, President Donald Trump hosted a picnic for military families on the South Lawn during the afternoon, a few hours before fireworks lit up the National Mall. Independence Day festivities held in Washington featured a concert by the National Symphony Orchestra on the lawn of the Capitol, where “Margaritaville” singer Jimmy Buffett, The Temptations, The Beach Boys and Luke Combs performed. The Fourth of July holiday marks the adoption of the Declaration of Independence by congressional delegates in Philadelphia on July 4, 1776. More than two centuries later, however, it was the pursuit of hot dogs that defined the holiday at Coney Island on the waterfront of New York’s borough of Brooklyn, where Nathan’s Famous hot dogs and restaurants held its 46th annual hot dog-eating contest. Joey Chestnut once again dominated the competition. The 34-year-old from San Jose, California, won his 11th “Mustard Belt” by downing an astonishing 74 wieners – topping the record of 72 he set last year. In the women’s division, Miki Sudo, 32, of Las Vegas, won her fifth title by putting away 37 hot dogs. Heat and humidity hung over the competition, as well as much of the country. The National Weather Service issued heat advisories for the Plains states eastward to the Mid-Atlantic region. Temperatures hit the 90s with the humidity making it feel like 105 to 110 degrees Fahrenheit (40-43 degrees Celsius). On a day that features countless patriotic parades nationally, the pro-gun control group Moms Demand Action held several marches around the country, including one in Webster Groves, Missouri, where Democratic Senator Claire McCaskill joined them. “It was hot! But wonderful,” McCaskill said on Twitter. New York put on an evening fireworks display that ranks as the country’s largest, according to Macy’s (M.N), the retailer that sponsors the annual event. 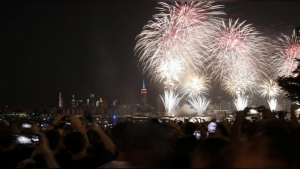 More than 3 million spectators and 12 million television viewers watched 75,000 shells illuminate the night sky over the East River to the music of singer Kelly Clarkson. Bostonians celebrated with the Boston Pops along the Charles River, joined by pop vocalist Rachel Platten. Because of wildfires in southeastern Colorado and drought in the Denver area, most area communities canceled public displays of fireworks, officials said. Los Angeles held fireworks, as well as a concert and other celebrations at the Hollywood Bowl. Up the coast, San Franciscans watched fireworks on the bay near the Golden Gate Bridge. In recent years, law enforcement agencies have been on the alert for suspicious activity during the holiday celebrations. Officials said they took extra precautions this year, but have not detected any credible security threats. An Ohio man was arrested on Sunday on suspicion of planning to detonate a bomb at Cleveland’s Fourth of July celebrations. The post On July Fourth, Americans celebrate life, liberty appeared first on SABC News – Breaking news, special reports, world, business, sport coverage of all South African current events. Africa's news leader..
A woman was arrested Wednesday after staging a dramatic protest against President Donald Trump’s separation of migrant families, climbing the Statue of Liberty and forcing its evacuation on Independence Day. Wearing a “Rise and Resist” T-shirt, the woman on the fabled symbol of welcome to immigrants at one point told authorities that she would only come down when parents are reunited with all migrant children separated from them by the Trump administration. “She resisted at the beginning. She would not come down by voice command,” National Park Service spokesperson Jerry Willis told AFP. So police placed her in custody, Willis said, noting that the woman was facing multiple federal charges including trespassing and disorderly conduct. “We assume that she is protesting,” Willis said, based on the woman’s remarks to police. After nearly four hours on the statue, the woman finally accompanied police down off the monument, tethered to them by wires. The woman, who has not yet been identified, at one point walked from one side to the other beneath the statue’s sandal. New York police assisted US Park Police to remove her from Lady Liberty. Local media first reported that the woman was among demonstrators opposed to Trump’s immigration policy who protested at the site earlier. But Rise and Resist NYC, which organized the protest, said her protest on the statue was not part of the group’s move. At least six people were arrested for hanging a banner around the base of the statue that read “Abolish ICE,” referring to US Immigration and Customs Enforcement, the agency at the forefront of the immigration debate. They too were facing misdemeanor federal charges, Willis said. Cruise operator Statue Cruises said it had to turn away more than 2 000 people waiting to take their tour to the famed statue. Trump has made cracking down on illegal immigration a cornerstone of his administration. As a result of Trump’s crackdown, distraught children were separated from their families and, according to widely broadcast pictures, held in chain-link enclosures. His one-time “zero tolerance” practice of separating migrant parents from their children at the Mexican border triggered international condemnation. While the policy was abandoned, it is still unclear how and when some 2 000 migrant children will be reunited with their parents. Many trying to cross the US-Mexico frontier are destitute, fleeing gang violence and other turmoil in Central America. 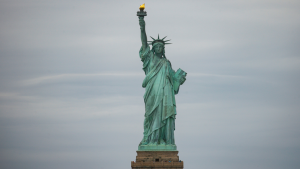 The post Woman who scaled Statue of Liberty to protest immigration policy arrested appeared first on SABC News – Breaking news, special reports, world, business, sport coverage of all South African current events. Africa's news leader.. The South African government says it will not bow down to pressure to normalise its diplomatic relations with the state of Israel. This follows concerted efforts by pro-Israeli groups to urge the Pretoria administration to reinstate its ambassador to Tel Aviv. The South African government recalled its Ambassador to Israel, Sisa Ngombane two months ago following the killing of at least 60 Palestinian protesters, and the wounding of about 2 000 more along the Gaza strip by Israeli forces. The Jewish lobby groups have denounced the move to recall the country’s Ambassador as “outrageous”, whilst pro-Palestinian activists have called for the immediate downgrade of the South African embassy in Tel Aviv. 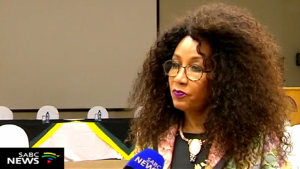 Briefing the media on Tuesday in Pretoria, International Relations Minister Lindiwe Sisulu reiterated government stance not to reinstate its Ambassador back to Tel Aviv. The post SA will not reinstate ambassador to Tel Aviv appeared first on SABC News – Breaking news, special reports, world, business, sport coverage of all South African current events. 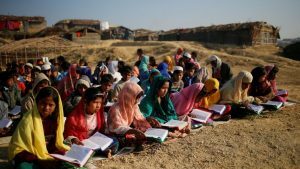 Africa's news leader..
Muslim Rohingya continue to flee Myanmar’s Rakhine state, many testifying about violence, persecution, killings and burning of their homes by soldiers and Buddhists, the United Nations human rights chief said on Wednesday. Earlier, Kyaw said during the debate that Zeid’s report contained information that was “distorted or exaggerated”. He blamed the violence on militants who attacked Myanmar government forces. “The root cause of the tragedy was terrorism and terrorism cannot be condoned under any circumstance,” Kyaw said. So far this year, 11,432 Rohingya have reached Bangladesh, where more than 700,000 have fled since an August military crackdown in Myanmar’s northern Rakhine state, Zeid said. “No amount of rhetoric can whitewash these facts. People are still fleeing persecution in Rakhine — and are even willing to risk dying at sea to escape,” he said. The citizenship issue is at the core of discussions on their status, Zeid said, adding that the cards “mark the Rohingya as non-citizens, in keeping with the government’s characterisation of them as foreigners in their own homeland”. Authorities in mainly Buddhist Myanmar deny carrying out large scale human rights abuses, which the United Nations has described as ethnic cleansing. Authorities say a crackdown in Rakhine is a necessary response to violence by the Arakan Rohingya Salvation Army (ARSA) militant group, which attacked Myanmar security posts. Kyaw said a top priority for his government was to find a “sustainable solution” in Rakhine. It had agreed with Bangladesh in January 2018 that repatriation of refugees would be completed within two years, he said. The post Rohingya still fleeing violence, persecution in Myanmar – U.N. rights boss appeared first on SABC News – Breaking news, special reports, world, business, sport coverage of all South African current events. 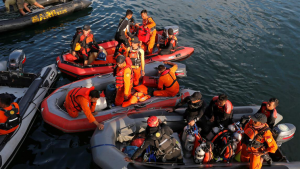 Africa's news leader..
At least 29 people died after a ferry sank near Indonesia’s Sulawesi island, officials said on Wednesday, as rescue teams searched for dozens of missing passengers a day after the country’s latest ferry disaster. Tuesday’s sinking came a few weeks after an overcrowded ferry sank on Lake Toba, one of the world’s deepest volcanic lakes, claiming more than 200 lives. The regional disaster mitigation agency said 29 people were confirmed dead in Tuesday’s accident and 41 remained missing. Another 69 passengers had been rescued. The ferry was carrying an unknown number of vehicles when it began to fill with water and sink. The vessel was close to shore and the captain ran it onto a reef in a bid to help the rescue effort, a transport ministry official told Reuters. Television images on Tuesday showed dozens of passengers hanging on to the keeling vessel or bobbing in the water wearing life jackets. Indonesia suffers frequent boat sinkings with basic safety rules often flouted and vessels overloaded. After last month’s sinking, one of the deadliest in nearly a decade, a two-week search and rescue effort located the vessel at a depth of 450m with victims trapped inside, but technical and logistical challenges forced the recovery to be called off. The post Indonesia says at least 29 dead in ferry sinking appeared first on SABC News – Breaking news, special reports, world, business, sport coverage of all South African current events. Africa's news leader..
North Korea has scheduled the dismantlement of its nuclear bomb test site for sometime between May 23 and 25 in order to uphold its pledge to discontinue nuclear tests, the country’s state media reported on Saturday a month ahead of a historic summit. “The Nuclear Weapon Institute and other concerned institutions are taking technical measures for dismantling the northern nuclear test ground in order to ensure transparency of discontinuance of the nuclear test,” KCNA said. Trump’s Secretary of State Mike Pompeo said on Friday that North Korea can look forward to “a future brimming with peace and prosperity” if it agrees to quickly give up its nuclear weapons. South Korea’s presidential office echoed the sentiment on Sunday, saying it shows Pyongyang’s willingness to denuclearise through actions beyond words. However, in spite of its pledge to stop testing, North Korea has given no indication it is willing to go beyond statements of broad conceptual support for denuclearization by unilaterally abandoning a nuclear weapons program its ruling family has seenas crucial to its survival. 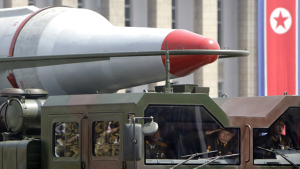 In announcing the plan to shut Punggye-ri last month, Kimsaid North Korea no longer needed to conduct tests because it had completed its goal of developing nuclear weapons. KCNA said journalists, including from the United States and South Korea, would be invited to cover the event, to “show in a transparent manner the dismantlement of the northern nuclear test ground to be carried out”. The exact date of the closure will depend on weather conditions, the agency said. To accommodate the travelling journalists, North Korea said various measures would be taken including “opening territorial air space”. The post North Korea details plans to dismantle nuclear bomb test site appeared first on SABC News – Breaking news, special reports, world, business, sport coverage of all South African current events. Africa's news leader..